I did not get a chance to write a wrap up last week. This week, then, I’ve been thinking of how I would summarize the past two weeks. I guess I could say I’ve been thinking outside of the box a lot more lately. It is not my style. I like to go down the checklist and get it done. But I’m finding Raisin is much more receptive, interested, and quick to learn when I’m more loose about finishing things. So the past two weeks we’ve continued to play school. First, with the gorgeous spring weather that has finally arrived, we’ve played outside, doing math problems and spelling words in between swinging and running. A few times I’d give him the math problem orally (a word problem) and he would do it in his head. A few times I’d bring out paper and he’d have to answer 2 or 3 every 5 or 10 minutes. It was infrequent enough that he was okay with it. He loved the outside way to do spelling words: he had to write them in cursive with his finger in the grass. Not everyday will we do finger handwriting practice, but it is a nice change from the copywork and spelling practice I normally give him. We had fun inside too. We did an Easter egg hunt with the day’s spelling word phonograms inside the eggs (it was harder than I thought it would be for him to unmix the phonograms into familiar words: definitely something to work on again. I’m trying to make an effort to help Strawberry learn things too. I was doing all kinds of fun enrichment with Raisin when he was this age, but I feel I don’t do as much with Strawberry since I’m always helping out Raisin now! We got out the play dough, the paints, and the color-with-water books (my absolute favorite!). The Mega Pack has much more than just the play dough mats! Strawberry loved “dressing” the girls on Life Over C’s play dough seasons mats. Her favorite was the winter season scene, because then could add boots and gloves. She also put “glasses” on all the girls’ eyes. 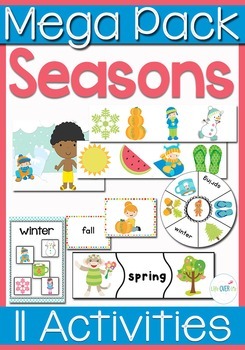 We’re still reading about shapes and I’m (obviously) introducing seasons and colors as well. It is so exciting to me to see my little one learning! That’s not to say it’s not exciting to see my six-year-old learning too. He is getting more comfortable with math and spelling. He is loving learning about everything else too! I simply feel he is enjoying school, and that is how it should be. No more tears. That said, there is one thing getting me want to crawl into a curriculum box. Our science teacher at co-op has resigned for the rest of this year and for next year due to family illness. I don’t blame her. I would definitely do the same thing. The problem is, I have always defaulted to her weekly lessons for a basis on what I wanted to teach at home myself! I am not a science person. I don’t like hands on experiments were I have to search all over the house for what I need! My default answer is to buy an all-in-one kit (I’ve been eyeing Nancy Larson Level 2) and read a script to teach him science. But I know that I could figure it out if I wanted! I could piece together lessons from what I find online. It would certainly save a lot of money! And it would definitely be good to be able to follow my curious child’s whims as they arise. So, given the pluses and minuses of it all, what would you do? A boxed, open and go science? or a cheaper, more hand made self-directed science? As much as I love our more casual school theses days, I feel a bit nervous about trying to do science that way too! What do you do to “think outside the box” once weather gets nice and warm?